“‘A Frankenstein Monster’: Henry Kissinger, Richard Nixon, and the Year of Europe,” tells the story of the severe crisis in US–European relations when Henry Kissinger was directing American foreign policy. 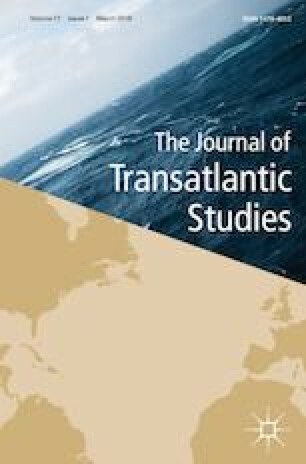 Referencing contemporary concerns over the Trump Presidency’s harsh rhetoric and actions toward the European Union, the article demonstrates that such tensions have a long history in the US–European relationship, and are rooted in the concerns of American domestic politics, which Henry Kissinger well understood. Kissinger’s policy choices during the crisis represented the dilemmas that exist between domestic political priorities and alliance relationships, and may hold lessons for today’s US–European relationship. Richard Nixon Press Conference, https://www.presidency.ucsb.edu/documents/the-presidents-news-conference-86. Accessed 31 Jan 1973. Richard Nixon, Question-and-Answer Session at the Executives’ Club of Chicago. https://www.presidency.ucsb.edu/documents/question-and-answer-session-the-executives-club-chicago. Accessed 31 Mar 1974.